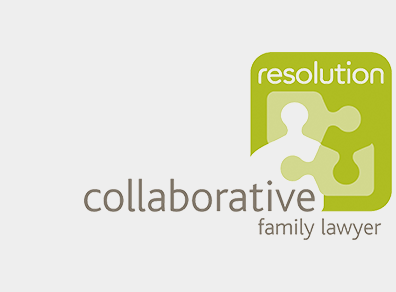 This week is National Family Dispute Resolution week (25-29 November 2013). Family lawyers, mediators, collaborative professionals, and those who work with children are coming together to raise awareness of alternatives to court for separating families. There are events going on all over the country, and as always we’re involved! Our Adam Moghadas has been busy. Not only was he a guest on BBC Radio Cambridge’s Drivetime show last week, he also attended the launch of the initiative on Monday 25 November at the House of Lords. As well as enjoying the history and theatre of the place and spotting Black Rod patrolling the corridors, he heard speeches from (and chatted with) Chair of Resolution Liz Edwards, Justice Minister Lord McNally and Lady Butler-Sloss, who were all declaring their commitment to raising public awareness of non-court alternatives for working out the consequences of family breakdown. 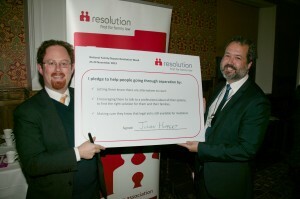 Adam was accompanied by Cambridge’s MP Julian Huppert, who also expressed a sincere interest in spreading the word and reducing the impact of separation by the use of non-court processes – you can see him below signing the Resolution Pledge! Like most Resolution-affiliated lawyers, we at CFLP are passionate about trying to keep families out of court if it’s possible to do so. We know that the stress and expense of court proceedings during what is already a difficult time are best avoided if they can be, for everyone’s sakes. There are reasons why you might end up in court: for instance, if some form of emergency protection (personal or financial) is required, if there has been deceit, or if one person is refusing to engage in discussions. But in most cases, there are other avenues open to you if your family is changing and you’re trying to sort out arrangements for your kids and/or your money and property. 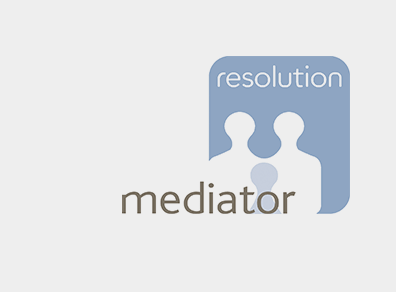 • Mediation is where the two of you meet with an experienced third party mediator and go through a process that helps you to talk and make decisions which you can both tolerate, which form the basis of an agreement between you which can be turned into a binding court order. • Collaborative law is where each of you engages a specially-trained lawyer and decisions about the future are made in a series of meetings that you all attend, under an agreement that says you won’t use the court, except to send in paperwork for the final binding order. • Arbitration is where you choose a specially-trained and experienced arbitrator to make a decision about matters on which you can’t agree – it’s like having a private judge, and you both agree to abide by the decision, which is made binding by the court. 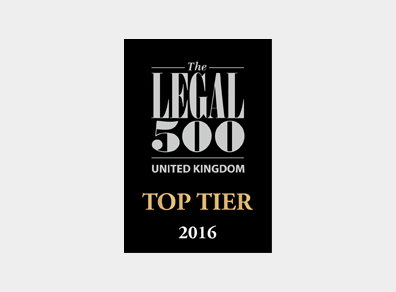 Mediation and collaborative law work for any family law issue, but arbitration is only available in financial cases. We’ve written about all of these processes before – just follow the links in the text to see our previous blogs going into more detail about how they work. 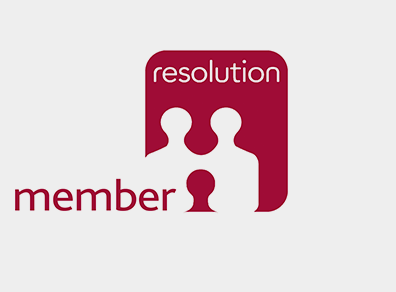 As part of its preparations for this week’s activities, Resolution commissioned a survey to find out what the general public knows about the different ways of working things out on divorce. The results show that there are low levels of awareness of any way other than court. A glimpse at the way the media reports high-profile divorces may give an insight into why. Just look at last week’s coverage of the case of Scot and Michelle Young, who have apparently run up legal bills running to millions in lengthy court proceedings only to have the judge find that he didn’t really believe either of them. If divorce is always a bloody fight – in the papers, on the telly, written about in blogs and filmed for YouTube – it’s understandable that few people realise that there’s a different, better way to handle things. It also makes it harder for those who do want to take that alternative route, as society collectively puts pressure on people to do things in a particular way and being different feels like a risk. We need to spread the word about mediation, collaborative law and arbitration, because the way our society does things on separation and divorce matters. Children’s futures can be better if separating parents are encouraged to talk out their differences with a trained mediator or trained collaborative lawyers rather than taking part in an adversarial process that encourages them to focus on each other’s parental shortcomings. Financially, precious pennies are preserved if former spouses shy away from fighting in court over assets and income that have to be shared out fairly to sustain two households rather than one. Non-court alternatives offer opportunities to investigate, to find answers, to develop new ways to communicate, to tie up all loose ends when a relationship finishes. They offer a better gateway to the future for families. We need to make sure that people realise there’s a choice. 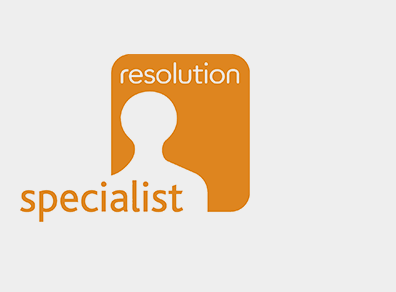 Click here if you’d like to have a look at Resolution’s guide to alternatives to court, Separating Together, which is free to download. To make an appointment to come and see Gail, Simon, Adam or Sue please give us a call on 01223 443333. In the Young v Young case can we not perhaps blame the lawyers involved. Did the lawyers measure the money involved or did they measure the merits of the case? How much money could have been made by the lawyers if the parties mediated and arbitrated as compared to litigation, where Mrs Young ran out of funding (loans) during the investigation before she actually came to court.